If you are planning to add two storeys building on the back of your house, maybe some following roof designs could help. 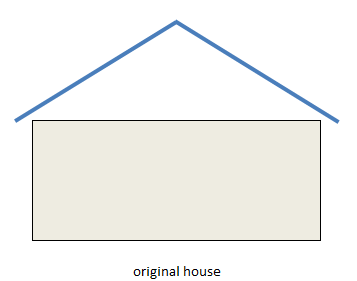 The above sketch is the original house with an empty space at backyard, the backyard is on the right side of that house sketch, the front of the house is to the left of sketch. Two storeys building is built at the back of the house. 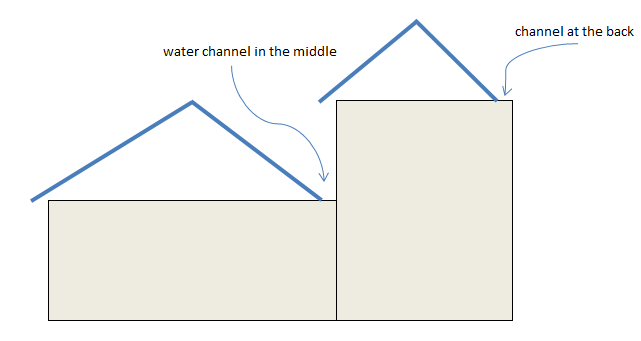 There is a water channel in the middle that holds the water from the roof of the second level and some water from the roof of the original house. The original roof tends to leak because the water falling from the second roof. It needs water channel at the back of the second roof so that water does not fall into the neighbor's yard. These designs are often chosen, but this design has a high risk of leakage and not economical. 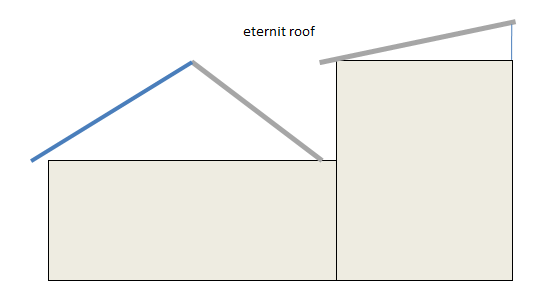 Storey building with eternit roof, it is gray lines on the sketch. This design does not need a water channel on the second level. Water from the roof of the second level are all channeled to the front, and gathered at the water line in the original house. 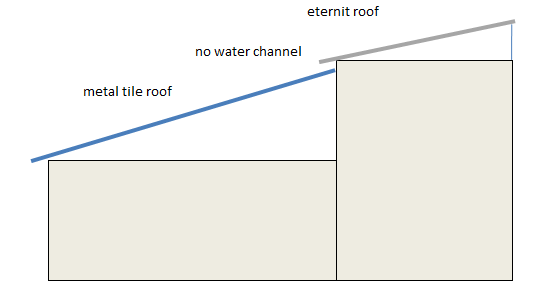 The back of the original house roof is using eternit in order to reduce splashed water from the second level roof. This is the best design in my opinion. Using eternit for storey building, the water from the roof of this second level is fallen forward, so no need water channel at the back. The roof truss of the original house is modified, so that the upper end is attached to the roof of second level. The original house roof can use metal tile to add beauty. In this design there is absolutely no water channel needed, thus less likely to leak and save on development cost and maintenance cost. You can raise the ceiling in the original house to get a bigger volume of room inside. You can also make room in the attic of original house, but must consider the weight of materials and goods that filled inside the attic room, except if the foundation and pillar of the original house are strengthened. Window or ventilation for second floor can be added in space between upper and lower roof. Rainwater from roof catchment flows to the front yard of the house, it is useful and can be used to irrigate plants in the garden in the front yard. The rainwater can be trapped in water tank or reservoir, or collected in the infiltration pit to soak into the ground. Rain water that seeped into the soil has higher quality than sewage or sewer / ditch water that seep into the ground. Because sewage water is contaminated with chemicals such as detergents, and other contaminants. Rain water that seeped into the soil will help to reduce the risk of flooding. Good quality groundwater can be pumped up to fill water needs of a family that occupied the house. After about 2 years, it is usually cheaper to use pumped ground water than using water from municipal water system. Should be a concern that the rain water collected in the tank (reservoir) is not good as drinking water due to lack of mineral content. Rainwater directly used as drinking water will absorb and drain minerals from your body, instead of giving minerals to your body. Too much drinking rainwater will cause brittle bone and tooth loss. Rainwater that is absorbed into the soil can be used as drinking water, because it absorbs and contains a variety of minerals from the soil which are needed by your body. If you are forced to use rainwater directly as drinking water, without absorption into the soil, then you need to increase your intake with foods rich in minerals such as: calcium (lime), iron, magnesium, zinc, and others. Do not forget to check roof pitch to minimize risk of water leaks. 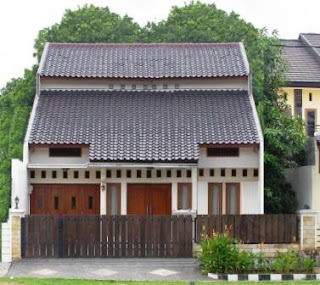 House with rain water falling to the front side will be look like the very top picture.